Delray Beach is a top destination in Palm Beach County, FL. There are SO many fun things to do in our town. We’ve provided links to popular websites about Delray Beach. 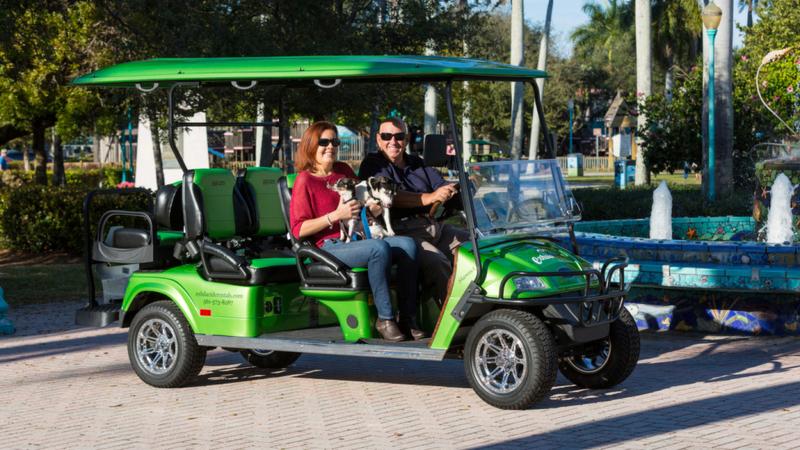 Below that we’ve listed a few of our favorite things to do in Delray, all of which are accessible on Exhilaride Golf Carts. 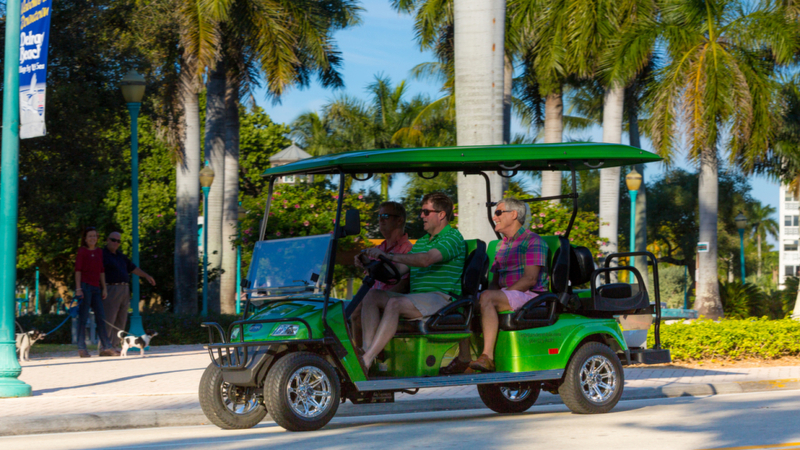 With two miles of public beachfront, Delray Municipal Beaches attract over 1 million visitors a year and are designated Blue Wave Beaches by the Clean Beaches Council for their clean and well-managed beaches. Chairs, Umbrellas, and Cabanas are available for rent at the beach. Delray’s ONLY Mini-Golf Center gets rave reviews from visitors and locals alike. There are two 18-hole courses, one of which is more challenging than the other. A café serves snacks, beverages (including those for adults only) and ice cream. The Sandoway House Nature Center is located in a historic 1936 beachfront home in Delray Beach, Florida. The Center offers a glimpse into South Florida’s fragile marine and freshwater environments through educational exhibits and programs. Educational programs are offered to the public including: Shark and Alligator Feedings, Guided Historic Tours, Nature Walks, Astronomy Nights and special events such as Earth Day. Admission is $4 per-person for everyone three years of age and above; Palm Beach Zoo members are free. Please visit the website for more details on hours of operation and special events! A hidden gem… A gorgeous beach with a nice picnic area, playground and facilities (bathroom, changing rooms, shower) awaits you North of Delray Beach on A1A. If you get very lucky you may happen upon Sea Turtles nesting or hatching (May-October). This is a more natural beach environment than the Municipal beach, and parking although FREE is VERY limited. We suggest you go early in the morning, or in the later afternoon. Bring a lunch/dinner and eat at the picnic tables! A beautiful lake-front park with boat access, pavilions, walking and biking trails, a playground and more awaits visitors and residents within the city limits. In addition there’s a 2.5 acre fenced-in section of Lake Ida Park, made especially for your K-9 buddies to socialize, exercise and just plain have fun. There’s a large Fido section and small Fido section complete with drinking areas. Don’t forget your pooch and people manners, though. Basic rules of etiquette will apply. Delray Beach boasts a world-class Tennis Center right in the downtown area. Check the website for more details. South End of Municipal Beach, across from Casauarina Ave. This is the top-rated attraction in the Delray Beach area according to TripAdvisor.com. Getting to this locale via Golf Car will be a nice excursion. Please see our “map” tab for more information. Due to the 40 mph speed on Jog Road, you will need to park your Golf Car in a nearby Professional Office complex and take a short walk along Jog Road to the Wetlands entrance. There is nothing else like the Delray Beach Arts Garage in South Florida–no other nonprofit organization that presents musical icons and legends-in-the-making, produces Off-Broadway theater and world premieres, offers scholarships and impacts over 2,000 underserved children, all under one roof in an intimate 150 seat venue. A hidden gem… A gorgeous beach with a nice picnic area, playground and facilities (bathroom, changing rooms, shower) awaits you North of Delray Beach on A1A. If you get very lucky you may happen upon Sea Turtles nesting or hatching (May-October). This is a more natural beach environment than the Municipal beach, and parking although FREE is VERY limited. We suggest you go early in the morning, or in the later afternoon. Bring a lunch and eat at the picnic tables! Delray Beach boasts a world-class Tennis Center right in the downtown area. There are several “drop-in” programs for youth that meet twice per week. Check the website for more details.